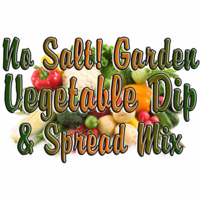 Description: We've left the salt out of this popular and classic dip mix to make it salt-free and reduced sodium. It makes a fresh, creamy dip loaded with onion, garlic, carrots, bell peppers, and herbs with a hint of lemon to brighten it up. There are two salt-free options: "No Salt" in which we've replaced the salt with extra onion or "Faux Salt" in which we've replaced the salt with a salt substitute. Features: No salt. No added MSG. Gluten Free. Vegetarian / vegan. Made from scratch, in small batches, from our own original recipe in Ohio. Abbreviated Ingredients "No Salt": vegetable seasoning, onion, garlic, tomato powder, herbs. Abbreviated Ingredients "Faux Salt": vegetable seasoning, onion, garlic, tomato powder, salt substitute, herbs. Packaged in a facility that handles wheat, milk, soy, egg, peanuts, and tree nuts. Just a couple of Notes: You can pair this mix with Spinach Flakes to make Spinach Dip Mix (3 Tbls. Garden Vegetable Dip Mix + 2 Tbls. Spinach Flakes). We also offer this mix made with sea salt if you prefer, here.